The Quebec Regional Center was well represented at the 2nd International Workshop on Beluga Whale Research & Conservation held in Mystic, Connecticut. In addition to the lecture given by Regional Director Stéphane Lair entitled “Causes of mortality in St. Lawrence Estuary Beluga Whales (Delphinapterus leucas): changes in occurrences over the last 35 years”, the CWHC-Quebec team presented two scientific posters; one on skin lesions in St. Lawrence belugas, prepared by Rozenn Le Net and one on the medical aspect of the translocation of a beluga trapped in a river, prepared by Émilie Couture. 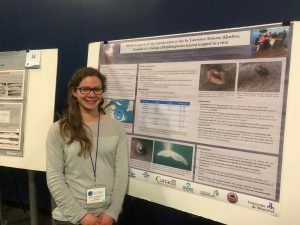 Emilie Couture and her poster on medical aspects of the translocation of a trapped beluga. This workshop brought together researchers and stakeholders from several countries working on the conservation of different beluga populations.